Actively checks your computer for anti-virus software, firewall protection, and web security, and threats in your open applications. I've read and accept the McAfee License Agreement. 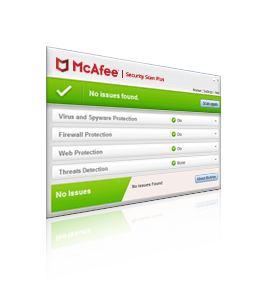 Easily check my computer for anti-virus software, firewall protection and web security at no cost McAfee Security Scan Plus is a free diagnostic tool for you to check your computer for core protection and determine if its on and up to date. I don't want my productivity to be interrupted during program installation and updates Silently installs and updates in the background and does not interrupt productivity. Quickly find out if my computer is at risk Fast Scan Time! Instant security status lets user know if their computer is at risk and recommends solutions to solve security issues in seconds. Security Recommendations if my computer is at risk Alerts direct customer to McAfee offerings if antivirus software, firewall protection or web security is out-of-date or not found. Offers also appear for users who are protected but may want to consider other security software products. Customize scanning frequency You can customize scan frequency. Scheduled scan provides three alert options to the user: Scan Now, Cancel, Remind me later. Scan will automatically start 20 seconds after alert notification. Seamlessly auto updates and scans your computer in less than 2 minutes. Customizable alerts warn you of potential threats. Please read this License Agreement carefully. By clicking "Agree" and using the Software, you are agreeing to this license and our Privacy Notice. I have read and agree to the terms of the License Agreement and Privacy Notice.